Why is it that most cool-weather dinner recipes either contain buckets of heavy cream or have to cook for seven hours in the Crock-Pot? Chef Jodi Moreno of What’s Cooking Good Looking (who is responsible for all those elegantly styled veggies on your Instagram feed) to the rescue. 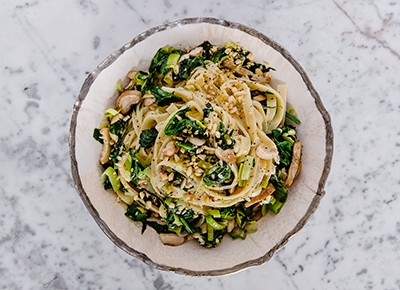 She’s dreamed up five speedy dinner bowls that prove hearty and satisfying can also be healthy. Grain-free pasta in less than 30 minutes? We’re coming over. Kelp noodles require no cooking and they’re a total nutritional powerhouse (not to mention gluten-free and paleo). This one is a breeze to whip up, packed with protein and easy to modify depending on the season (or your mood). Quick trick: Add a sauce like pesto to quinoa and make a typically bland grain irresistible. Comfort food that takes only 30 minutes to prepare and makes us feel great afterward? Right up our alley. Hemp and walnuts work double duty, creating a crispy crust and boosting the omega-3s in this dish. Jodi Moreno is a New York City–based recipe developer, food stylist and cookbook author. She is the creator of the popular wellness and recipes blog What’s Cooking Good Looking. Moreno is a co-owner of Neighborhood Studio in Brooklyn, New York, a test kitchen and photo studio that also hosts community dinners, cooking classes, workshops and events.